This course is about the mathematics that is most widely used in the mechanical engineering core subjects: An introduction to linear algebra and ordinary differential equations (ODEs), including general numerical approaches to solving systems of equations. Want to learn how to think clearly about important financial decisions and improve your financial literacy? Finance for Everyone will showcase the beauty and power of finance. This introductory finance course will be a gateway into the world of finance and will examine multiple applications to apply to your everyday life. Join us to better understand how to apply frameworks and tools to make smart financial choices. You will be able to value the impact of different choices available to you: from renting or buying, evaluating car, home and student loans, or deciding whether to go to college versus pursuing a new idea to simply understanding how the financial world works. Finance is simultaneously a way of thinking and a set of tools. Finance is everywhere. There are no prerequisites for this course except for a sense of curiosity and a positive attitude. However, a comfort level with algebra and numbers and an understanding of accounting (the language of business) will clearly help. We will, however, try to cover everything starting with fundamentals and highlight when there is a need to do some further work in specific subjects. In the first half of this course (4 weeks) we will introduce a new perspective connecting the quantized conductance of short ballistic conductors to the familiar Ohm's law of long diffusive conductors, along with a brief description of the modern nanotransistor. In the second half (4 weeks) we will address fundamental conceptual issues related to the meaning of resistance on an atomic scale, the interconversion of electricity and heat, the second law of thermodynamics and the fuel value of information. Overall I hope to show that the lessons of nanoelectronics lead naturally to a new viewpoint, one that changes even some basic concepts we all learn in freshman physics. This unique viewpoint not only clarifies many old questions but also provides a powerful approach to new questions at the frontier of modern nanoelectronics, such as how devices can be built to control the spin of electrons. This course was originally offered in 2012 on nanoHUB-U and the accompanying text was subsequently published by World Scientific. I am preparing a second edition for publication in 2015, which will be used for this course. The manuscript will be made available to registered students. "… the pedagogical imperative in research is very important to me, and so I really value a kindred spirit. Your (Datta's) online courses are just wonderful!" From anonymous student in previous offering. "The course was just awesome .. Prof. Datta's style of delivering lecture is mind-blowing." This course is the latest in a series offered by the nanoHUB-U project which is jointly funded by Purdue and NSF with the goal of transcending disciplines through short courses accessible to students in any branch of science or engineering. These courses focus on cutting-edge topics distilled into short lectures with quizzes and practice exams. This topic continues our journey through the world of Euclid by helping us understand angles and how they can relate to each other. 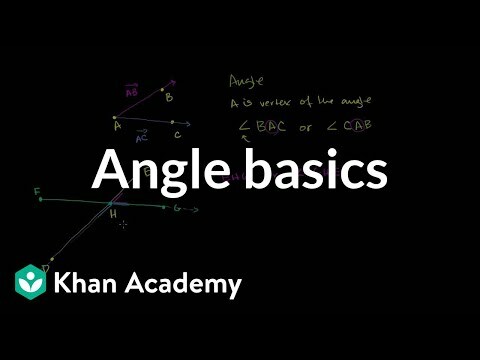 Angle basics. Measuring angles in degrees. Using a protractor. Measuring angles. Measuring angles. Acute right and obtuse angles. Angle types. Vertical, adjacent and linearly paired angles. Exploring angle pairs. Introduction to vertical angles. Vertical angles. Using algebra to find the measures of vertical angles. Vertical angles 2. Proof-Vertical Angles are Equal. Angles Formed by Parallel Lines and Transversals. Identifying Parallel and Perpendicular Lines. Figuring out angles between transversal and parallel lines. Congruent angles. Parallel lines 1. Using algebra to find measures of angles formed from transversal. Parallel lines 2. CA Geometry: Deducing Angle Measures. Proof - Sum of Measures of Angles in a Triangle are 180. Triangle Angle Example 1. Triangle Angle Example 2. Triangle Angle Example 3. Challenging Triangle Angle Problem. Proof - Corresponding Angle Equivalence Implies Parallel Lines. Finding more angles. Angles 1. Angles 2. Sum of Interior Angles of a Polygon. Angles of a polygon. Sum of the exterior angles of convex polygon. Introduction to angles (old). Angles (part 2). Angles (part 3). Angles formed between transversals and parallel lines. Angles of parallel lines 2. The Angle Game. Angle Game (part 2). Acute right and obtuse angles. Complementary and supplementary angles. Complementary and supplementary angles. Example using algebra to find measure of complementary angles. Example using algebra to find measure of supplementary angles. Angle addition postulate. Angle basics. Measuring angles in degrees. Using a protractor. Measuring angles. Measuring angles. Acute right and obtuse angles. Angle types. Vertical, adjacent and linearly paired angles. Exploring angle pairs. Introduction to vertical angles. Vertical angles. Using algebra to find the measures of vertical angles. Vertical angles 2. Proof-Vertical Angles are Equal. Angles Formed by Parallel Lines and Transversals. Identifying Parallel and Perpendicular Lines. Figuring out angles between transversal and parallel lines. Congruent angles. Parallel lines 1. Using algebra to find measures of angles formed from transversal. Parallel lines 2. CA Geometry: Deducing Angle Measures. Proof - Sum of Measures of Angles in a Triangle are 180. Triangle Angle Example 1. Triangle Angle Example 2. Triangle Angle Example 3. Challenging Triangle Angle Problem. Proof - Corresponding Angle Equivalence Implies Parallel Lines. Finding more angles. Angles 1. Angles 2. Sum of Interior Angles of a Polygon. Angles of a polygon. Sum of the exterior angles of convex polygon. Introduction to angles (old). Angles (part 2). Angles (part 3). Angles formed between transversals and parallel lines. Angles of parallel lines 2. The Angle Game. Angle Game (part 2). Acute right and obtuse angles. Complementary and supplementary angles. Complementary and supplementary angles. Example using algebra to find measure of complementary angles. Example using algebra to find measure of supplementary angles. Angle addition postulate. 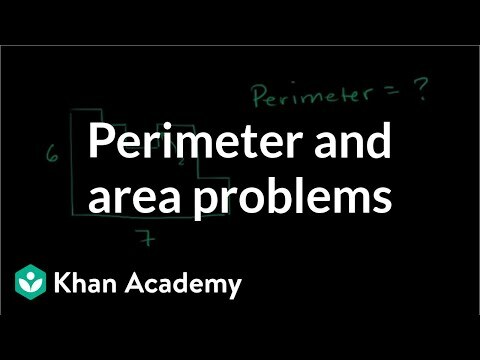 A broad set of tutorials covering perimeter area and volume with and without algebra. Perimeter and Area Basics. Area and Perimeter. Perimeter of a Polygon. Perimeter of a shape. Perimeter 1. Finding dimensions given perimeter. Area 1. Finding dimensions given area. 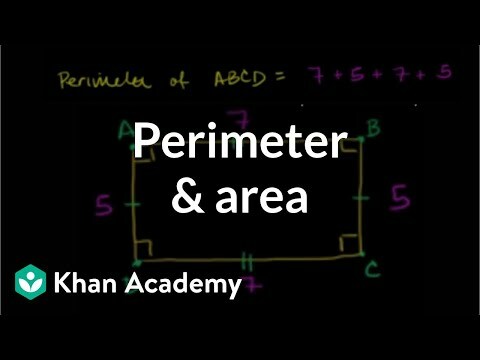 Perimeter and Area Basics. Triangle Area Proofs. Area of triangles. Interesting Perimeter and Area Problems. Area of Diagonal Generated Triangles of Rectangle are Equal. Area of an equilateral triangle. Area of shaded region made from equilateral triangles. Shaded areas. Challenging Perimeter Problem. Triangle inqequality theorem. Triangle inequality theorem. Koch Snowflake Fractal. Area of an equilateral triangle. Area of Koch Snowflake (part 1) - Advanced. Area of Koch Snowflake (part 2) - Advanced. Heron's Formula. Heron's formula. Part 1 of Proof of Heron's Formula. Part 2 of the Proof of Heron's Formula. Circles: Radius, Diameter and Circumference. Parts of a Circle. Radius diameter and circumference. Area of a Circle. Area of a circle. Quadrilateral Overview. Quadrilateral Properties. Area of a Parallelogram. Area of parallelograms. Area of a trapezoid. Area of a kite. Area of trapezoids, rhombi, and kites. Perimeter of a Polygon. Perimeter and Area of a Non-Standard Polygon. How we measure volume. Measuring volume with unit cubes. Volume with unit cubes. Measuring volume as area times length. Volume of a rectangular prism or box examples. Volume 1. Volume word problem example. Volume word problems. Solid Geometry Volume. Cylinder Volume and Surface Area. Volume of a Sphere. Solid geometry. Perimeter and Area Basics. Area and Perimeter. Perimeter of a Polygon. Perimeter of a shape. Perimeter 1. Finding dimensions given perimeter. Area 1. Finding dimensions given area. Perimeter and Area Basics. Triangle Area Proofs. Area of triangles. Interesting Perimeter and Area Problems. Area of Diagonal Generated Triangles of Rectangle are Equal. Area of an equilateral triangle. Area of shaded region made from equilateral triangles. Shaded areas. Challenging Perimeter Problem. Triangle inqequality theorem. Triangle inequality theorem. Koch Snowflake Fractal. Area of an equilateral triangle. Area of Koch Snowflake (part 1) - Advanced. Area of Koch Snowflake (part 2) - Advanced. Heron's Formula. Heron's formula. Part 1 of Proof of Heron's Formula. Part 2 of the Proof of Heron's Formula. Circles: Radius, Diameter and Circumference. Parts of a Circle. Radius diameter and circumference. Area of a Circle. Area of a circle. Quadrilateral Overview. Quadrilateral Properties. Area of a Parallelogram. Area of parallelograms. Area of a trapezoid. Area of a kite. Area of trapezoids, rhombi, and kites. Perimeter of a Polygon. Perimeter and Area of a Non-Standard Polygon. How we measure volume. Measuring volume with unit cubes. Volume with unit cubes. Measuring volume as area times length. Volume of a rectangular prism or box examples. Volume 1. Volume word problem example. Volume word problems. Solid Geometry Volume. Cylinder Volume and Surface Area. Volume of a Sphere. Solid geometry. This topic introduces the basic conceptual tools that underpin our journey through Euclidean geometry. These include the ideas of points, lines, line segments, rays, and planes. Euclid as the Father of Geometry. Language and Notation of Basic Geometry. Lines, Line Segments, and Rays. Recognizing rays lines and line segments. Specifying planes in three dimensions. Points, lines, and planes. Language and Notation of the Circle. The Golden Ratio. Identifying Rays. Measuring segments. Measuring segments. Congruent segments. Congruent segments. Segment addition. Segment addition. Algebraic midpoint of a segment exercise. Midpoint of a segment. 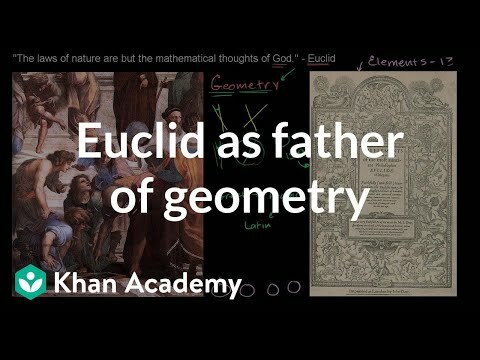 Euclid as the Father of Geometry. Language and Notation of Basic Geometry. Lines, Line Segments, and Rays. Recognizing rays lines and line segments. Specifying planes in three dimensions. Points, lines, and planes. Language and Notation of the Circle. The Golden Ratio. Identifying Rays. Measuring segments. Measuring segments. Congruent segments. Congruent segments. Segment addition. Segment addition. Algebraic midpoint of a segment exercise. Midpoint of a segment. Sal does the 80 problems from the released questions from the California Standards Test for Geometry. Basic understanding of Algebra I necessary. Interesting Perimeter and Area Problems. Challenging Perimeter Problem. CA Geometry: deductive reasoning. CA Geometry: Proof by Contradiction. CA Geometry: More Proofs. CA Geometry: Similar Triangles 1. CA Geometry: Similar Triangles 2. CA Geometry: More on congruent and similar triangles. CA Geometry: Triangles and Parallelograms. CA Geometry: Area, Pythagorean Theorem. CA Geometry: Area, Circumference, Volume. CA Geometry: Pythagorean Theorem, Area. CA Geometry: Exterior Angles. CA Geometry: Deducing Angle Measures. CA Geometry: Pythagorean Theorem, Compass Constructions. CA Geometry: Compass Construction. CA Geometry: Basic Trigonometry. CA Geometry: More Trig. CA Geometry: Circle Area Chords Tangent. CA Geometry: Secants and Translations. Interesting Perimeter and Area Problems. Challenging Perimeter Problem. CA Geometry: deductive reasoning. CA Geometry: Proof by Contradiction. CA Geometry: More Proofs. CA Geometry: Similar Triangles 1. CA Geometry: Similar Triangles 2. CA Geometry: More on congruent and similar triangles. CA Geometry: Triangles and Parallelograms. CA Geometry: Area, Pythagorean Theorem. CA Geometry: Area, Circumference, Volume. CA Geometry: Pythagorean Theorem, Area. CA Geometry: Exterior Angles. CA Geometry: Deducing Angle Measures. CA Geometry: Pythagorean Theorem, Compass Constructions. CA Geometry: Compass Construction. CA Geometry: Basic Trigonometry. CA Geometry: More Trig. CA Geometry: Circle Area Chords Tangent. CA Geometry: Secants and Translations.